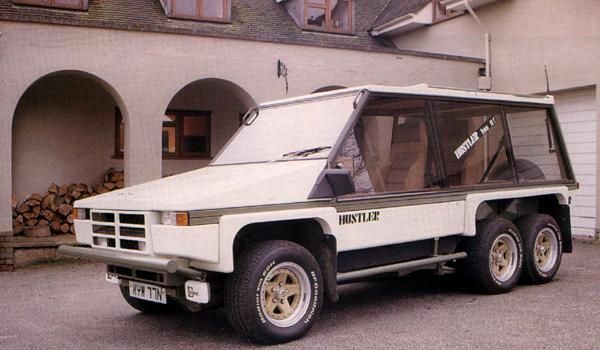 Hustler 6 - Mini-Based Motorised 6-Wheeler Shed? Found a pic of the V12 one. "1985 Highlander 6, powered by the 5.3-litre, 12-cylinder Jaguar engine, which apparently only found eight eager customers"
- I wonder how many of those 8 are still about? And how many owners are still traumatised beyond belief having driven them??? These were a conversion offered by Williams Town. It's based on a Mini Moke. So you took them a Mini Moke and they gave you that monstrosity? or they looked at the design and thought they could come up with something better (and failed) ?? From what I understand, you took them a Mini Moke, and they built this on top of it. No! That would be like trying to make an orange out of a potato -they're completely different animals. I will have to check with a friend who built a Six but as far as i can make out it was a low-slung steel floorpan mounted in a tubular square steel frame, acres of glass & aluminum for all-consuming dehydration, & optional lower fibreglass body panels. (the donor vehicle for the suspension/running gear/brakes/electrics could be whatever you wanted- Mini, 1100/1300, Moke etc). I have a strange deja-vu feeling about this car, like I've seen it at a show when I was a kid, or it was on a TV show or something. Hmm. i know what you mean, but i can't figure out if those memories relate to the car or the magazine of the same name !! Did the one you're thinking of have a pope in the back? And here's proof of the Lego connection! That back axle seems to be a bit too far back in the wheelarch..
.....you never know when you might have to do an emergency mass.